So the question is did I push it to the edge today? Can I still push it to the edge. .. can I push the body all the way? When racing on the track you have to live on the edge, push yourself to the limit. Running marathons is very different: it's about setting out at a good pace and winding it up till you finish or blow! Or like me last week... setting out at an easy pace and hoping you can hold it to the end. I didn't I fell to pieces at 34km and while I held on for a sub 3 it was a lot harder than I thought it would be. 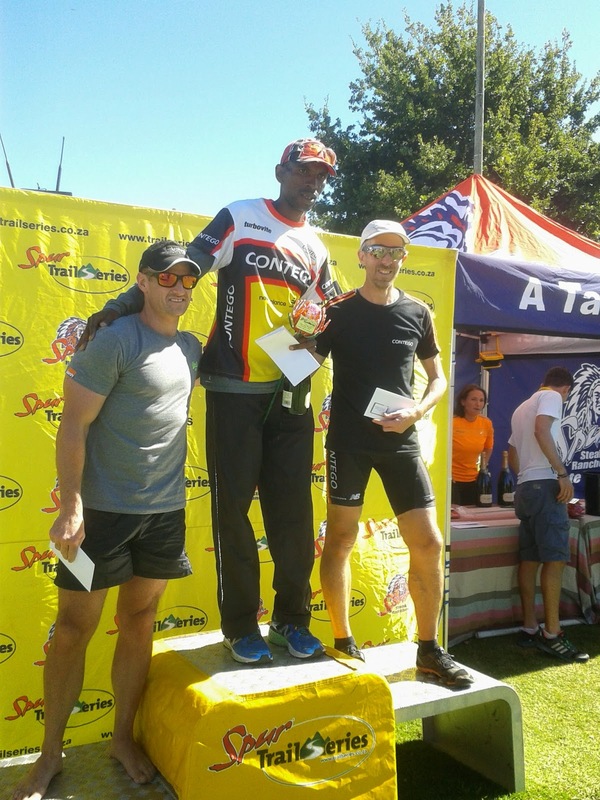 Maybe the 33km trail race the week before had something to do with that. 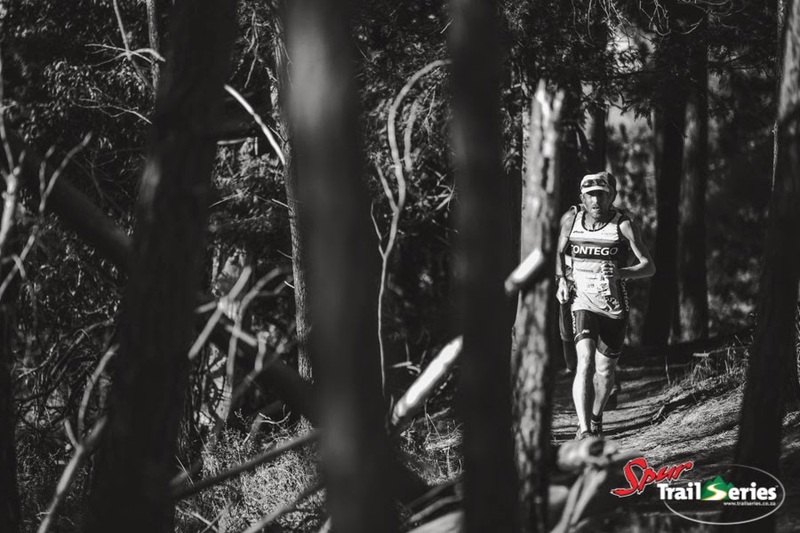 With the marathon out the way it was time to recover and get ready for the 4th race in the Cape Summer Trail Series. One week wasn't really enough time to shake the miles out of the legs! Oak Valley was a hive of activity when we got there at 06h30 just in time to see the guys in the 25km race heading out. The hour to our start didn't take long... Dawn set out for her run 15min before us so she would be out on the course to support! Tsungai (my 40+ competition) took off like a man possessed. We let him go. The someone chased and the Bernie and Raydon followed. I was 5th with 4 other guys with me. Trails aren't all slow technical climbs some are flat smooth windy paths... the km's ticked by at road speeds and we passed Dawn at 3km before the first forest. 2.5km of single track later we popped out on the gravel road and Dawn was playing marshal! We crossed the road and started toclimb the single track through the grass meadow to the next forest there were only 3 of us left chasing the top 4 (and one was coming back to us). We chewed him up and spat him out on the hill. I was trying to break the 2 guys hanging with me… But, maybe I wasn’t good enough, or maybe I’m just wasn’t prepared to push hard enough! I had done it one of them broke… before the next open section of trail which took us to another forest section and this was down over the river and up for the climb to the top again I pushed, but not hard enough to break the 18 year old as he only lost 5m to me and once the climb was over I could run away from him. He wasn’t giving up and even though I opened the 5m gap again on the last hill, I again didn’t capitalize (or couldn’t, too old, injured and slow!) I really needed to be red lining it on the flat run in to the finish. Then with the finish in sight and a little downhill he made his move and was gone! I couldn’t chase I don’t have that turn of speed anymore, Well done Tim! My team mate Tsungai had won with Raydon and Bernard (another team mate) a full minute behind, and us another 3 minutes down! Easy pace - it's all relative isn't it? Your easy pace is my speed session pace or maybe a little faster. Congrats on a good easy (?) run.